8 Ways to Make Your Office a More Inspiring Workplace! An organized and visually appealing workspace can make people feel more motivated to work and will lead to a happier team overall. A clean and trendy office showcases to visitors that you take your work seriously and care about the representation of your company. The old adage, “a cluttered room is a cluttered mind” holds just as true when applied to a workspace. When your office is messy and in disarray, people assume the same of you. A workspace that’s calming and organized is a more enjoyable place to work. Here are some simple and effective ways to redecorate your workspace and make it a place that people look forward to coming to every day. If your office is filled with stacks of paper and you’re often misplacing essential documents, then it’s time to reorganize your work environment and put everything in the right place. Not only will a clean workspace look more visually appealing, but you’ll find that it will be easier to concentrate and think effectively, not to mention you save time when you aren’t always searching for your documents. Once you decide to clean and organized your desk, it will be much easier to keep it that way. If you dedicate a few minutes each day to cleaning up your space, it’s a piece of cake to keep your area efficient and attractive. You’ll enjoy coming to a clean and neat desk every day and not feeling overwhelmed by clutter. To create a more inspiring and inviting work environment, you should have furniture in your office that creates a relaxed and comfortable atmosphere. Ensure sure all of your employees have an ergonomic task chair at their desk; no one works well when they are suffering from a repetitive stress injury. Also, if space permits, create an informal collaboration area by adding a comfortable couch, so people have a place to unwind, de-stress and work together in a relaxed setting. These small changes can make a big difference in creating a more welcoming workspace. Plants often create a sense of calm since they remind people of the outdoors and nature. 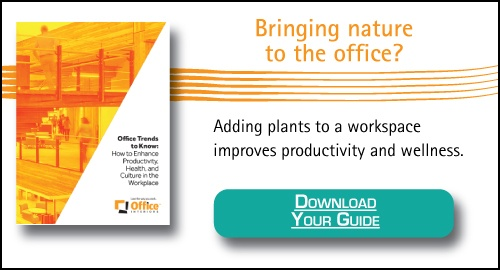 New research into biophilia indicates that by adding some nice plants throughout the office, people feel less stressed and more inspired to work. Also, it’s a fun and easy way to add some gorgeous décor to your space. Everyone loves the look of a plant. Make your employees feel inspired and ready to start their day by displaying positive and realistic company goals on a wall. People find it motivating to be part of a team, by showcasing the company’s expectations and what you hope to achieve, it can foster a sense of teamwork among team members who rarely work together directly. They will understand what their goals are for each day and will be proud to be part of the team. Also, showcasing the company’s goals can help foster some employee’s creative side and force them to think more imaginatively. In order to work effectively, it’s necessary to have effective lighting. A well-lit area will make it easier to stay focused and reduce eye strain. Bright space with lots of natural light is more likely to make people feel happy and energized whereas a dark and dreary workspace can make employees feel tired and bored. If your office doesn’t lend itself to plenty of natural light, investing in some lamps and decorative lighting will go a long way in creating a good work environment. To have fun at work and make it a place you enjoy a third of your day, many people decorate their desks with some family photos or other items that make them happy or less stressed. Memories of a fun family vacation or a picture of your friends can help you feel at home while you’re working, and you’ll end up enjoying your work more as well. No one like to sit down in the morning at a desk covered in piles of paperwork, folders or any of the other junk that can quickly accumulate at work. Keep all your important documents organized and your mind organized by keeping your desk free of clutter. Not only will you no longer need to worry about losing a file, but if you categorize all of your essential items you will be able to access the data you need faster than ever. You can even consider adding some playful decor items to the storage or shelving units as well to make your space more welcoming! Soothing and peaceful music keeps people feeling relaxed and engaged. Depending on the music it can keep people focused and ready to tackle the day. If your workplace is often chaotic with many distractions, the music might be an excellent way for employees to escape those distractions. Studies have shown that music is able to put people in a good mood naturally. When it’s early on Monday morning, and everyone is exhausted and dreading their work, music might be a great way to boost people’s spirits and get them feeling energized. Looking for more office design ideas? Check out this article on a few inspirational design elements to create the best layout for your office! 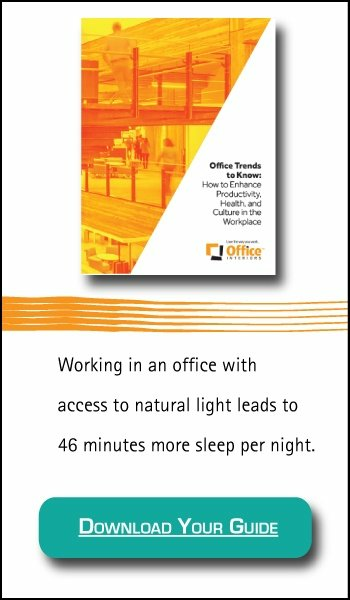 Did you know access to natural light at work can affect your sleep at night?